International Confex is the UK's leading event exhibition; bringing people together who organise any kind of event with providers of venues, destinations and event support services both in the UK and internationally. With everything you could possibly need to organise your 2007 events, fantastic networking opportunities and superior educational content; Confex is the perfect event for any event. Register and attend and you could be in with a chance of winning a Diamond Gucci watch worth £2000, courtesy of Insurex. VisitDenmark is also offering selected visitors the opportunity to experience first-hand how to run 'the perfect event'. This will involve a two day educational trip to Denmark departing from Confex on Thursday 22nd February. See the website for details and to apply. the Secret Garden an exciting spa area, which visitors will find hard to leave! the Fun Zone, with arcade machines and a penalty shoot-out. Celebrity Day, where visitors will be made to feel like celebs and may even spot a few! There will also be a variety of bars allowing visitors to take time away from the hustle and bustle of the show floor, a great opportunity for networking. The bars will include; the Blue & Green Bar sponsored by Early Action Group, the London Bar hosted by ISES and Visit London, the Oyster and Champagne Bar sponsored by Montblanc and the VIP Lounge which is sponsored by De Vere. Confex is committed to supporting the events industry. This means assisting, advising and inspiring you so that you can hold breathtaking and inspirational events as well as those that require cost efficiency or involve complicated logistics. We aim to provide you with the tools to help you enhance and further your career, which is why Confex Knowledge is an essential and exciting part of the event. Confex Knowledge consists of 45 FREE seminars (available via download and Podcast), a FREE high-level keynote speech each day and a FREE Advice Centre. Simon Woodroffe, founder of YO! Sushi, Alastair Campbell, best known as the spin doctor for the Labour Party and David Magliano, Director of Marketing for London 2012 will be the keynote speakers at this year's event. 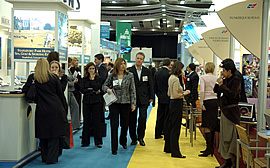 If you have any involvement in events, then you need to be at International Confex 2007.